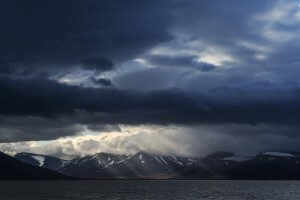 Svalbard is an archipelago of extremes. This remote icy wilderness is in perpetual darkness for over three months throughout the winter months when temperatures regularly drop to -20°C. The main island of Spitsbergen is home to the most northerly settlement on the planet – Longyearbyen – and there are more polar bears here than people! In fact, outside of the capital, you’re not allowed to explore without a guide and gun to protect you from the great white hunters if they should come too close. The scenery is severe from frigid glaciers, mountains entombed in snow and fjords whose sheer sides fall into a numb sea. When you visit Svalbard, whose land is mostly devoid of human life, you’re reminded that this isn’t a holiday; it’s a life changing expedition. For more than half of the year, Svalbard is entombed by frozen ocean. But the summer months offer a short respite from its icy confinement. 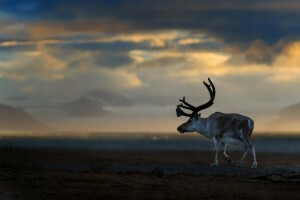 Endless daylight and relatively warm temperatures (reaching 7°C) turns the land into a flower-filled tundra with Arctic foxes and reindeers wearing their slimmer summer coats. The fragmented sea ice allows for ships to sail around the islands in search of wildlife – perfect for viewing beluga whales, bearded seals and seabirds. 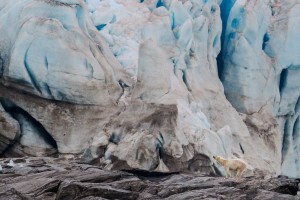 Svalbard isn’t really an ecotourism destination. This is because all of the food here has to be imported from mainland Norway (nothing can grow on the archipelago). Everything in Longyearbyen is powered by the local coal mine. There isn’t even a sewage system; raw sewage is pumped directly into the sea. However, I still believe in encouraging people to visit this dramatic region of the planet. You can’t get a more heart-wrenching reminder of the effect that we’re having on the earth than seeing a skinny and starving polar bear, the largest land carnivore, who’s been unable to hunt on the sea ice due to increasingly warm global temperatures. Protecting the Arctic from oil-drilling other damaging human activities will be easier if more people have experienced its magic and singularity. Your footprint here will be larger than when visiting other wildlife destinations but perhaps 14 days cruising through the Arctic Ocean will create more ambassadors of this fragile biome. 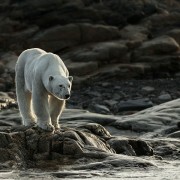 June and July are probably the best months to witness the wildlife of Svalbard. However, if it’s Northern lights, husky-sledding and snowmobiling you’re after; then the winter is the best time for a visit. 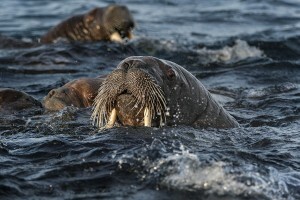 Most of the wildlife cruises leave from Longyearbyen which you can fly to via Oslo or Tromsø. Polar Quest offer some fantastic ship-based expeditions but it’s also possible to take shorter (and cheaper) trips from Longyearbyen with Basecamp Explorer to get a taste of the Arctic.